According to The Mail, firefighters are being dispatched to medical emergencies, in co-response with Ambulance services with six days of first aid training. A whistleblower is quoted in the piece, claiming the collaboration between fire and medical emergency services puts the public at greater risk of fires, and that fire personnel lack the equipment to deal with medical emergencies. Collaboration across our emergency services presents a real opportunity to maximise resources, enhance local resilience and improve the service delivered to the public. This Government is committed to supporting collaborative and innovative emergency response. Last year we introduced a statutory duty on the police, fire and rescue, and ambulance services to collaborate, and regularly review new opportunities to work together. Since 2013, we have also invested more than £88 million in collaborative projects. It is the responsibility of individual fire and rescue services to ensure their staff have the appropriate training and support in place to effectively undertake their role. The Times, Telegraph and Mail are among the publications that report on Border Force expenses. A Freedom of Information request found that three UK Border Force officials spent more than £18,000 on a trip to Antigua. According to The Mail, Antiguan customs authorities asked UK Border Force to help them tackle current smuggling methods at the country’s main airport. Three Border Force officers visited Antigua between 14 January and 5 February 2016 to help build the capacity and capability of Antiguan Customs at the county’s main airport. Smuggling of Class A drugs from the region, often having originated in South America, represents a very real threat to the UK. During this deployment Border Force staff shared expertise and provided practical assistance and training for local customs officers in border protection techniques and how to prevent current smuggling methodologies. The officers selected for deployment were based within the Caribbean region and travelled by economy flights. To find suitable and safe accommodation, Border Force would usually select a business chain hotel. For this deployment, none exist on the island, nor are there any hotels within the airport complex. Sugar Ridge offered the most suitable option available in terms of balancing cost and security and it offered a significant discount on their standard tourist rates. This department has very clear guidelines on the procurement of goods and services that provide the best value for money for the taxpayer. This applies to all travel, and travel related expenses which are routinely audited to ensure we keep in line with Government policy. According to The Express (print), adult migrants claiming to be unaccompanied asylum seeking children (UASC) in a bid to stay in the UK is at record levels. The paper reports on Freedom of Information figures which show that more than 13,000 UASC applications were made to the UK between 2010 and 2016. Of these, 2,644 were found to be over 18 when their age was disputed, and 580 were removed. We take our responsibility in asylum cases involving children very seriously and we are very clear that we will not tolerate abuse of the system, especially from adults claiming to be children. "Where there is no documentary evidence to prove an asylum seeker's age, but their claimed age is disputed, the Home Office will refer them to social services for an age assessment. "Individuals who are assessed to be adults will be processed through the adult system and expected to leave the UK if they are found not to need international protection. 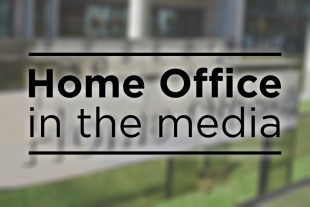 If they do not leave voluntarily, Immigration Enforcement staff will seek to enforce their departure. Following reports on a Facebook page called “Albanians in London”, featuring pictures of Albanians being illegally smuggled into the UK, The Mail identifies the individual who runs the page as Fari Llesh. According to the article, he is a former bank robber who is in the UK illegally. It is harder than ever before for those with no right to be here to remain in the UK. Whether it is working, renting a property, opening a bank account or driving a car, we can now take tougher action on those who flout the law. All employers in the UK have a responsibility to ensure they are not employing illegal immigrants. Anyone found employing an illegal worker having failed to carry the necessary right to work checks face penalties of up to £20,000 per illegal worker. We expect those with no basis of stay to leave voluntarily and where they do not we will enforce their removal. This includes foreign criminals of whom we returned more than 6,000 last year.